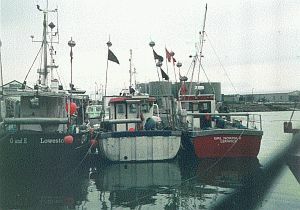 Lowestofts harbour,fishing and supply boats. The fishing has gone out of Lowestoft. Lowestoft old harbour,fishmarket and boats. Lowestoft ,like every other fishing port in the U.K. has seen its commercial fishing fleet vanish the result of bad management,EU policies and weak British governments. 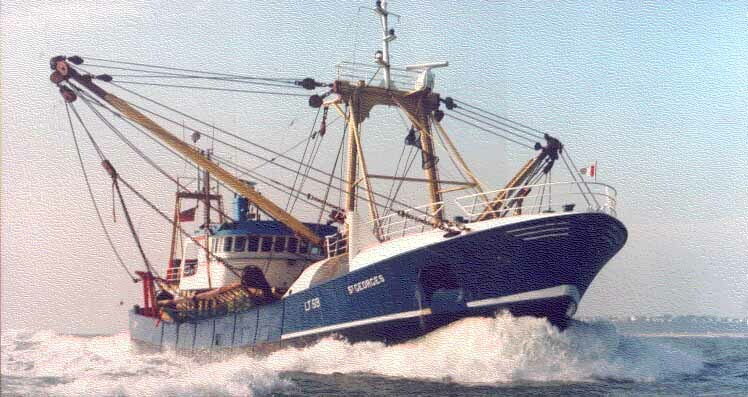 Fourty years ago dozens of firms ran hundreds of trawlers and fishing boats from the port,many local shops and industries relied upon the fishing boats and their crews for much of their trade,mine was one of them. The last Lowestoft based fishing firm of any size,Colne Shipping stopped trading in 2002 its boats ended up in Holland,or were scrapped .The following pictures were intended to give a snapshot of fishing in Lowestoft in the summer of 2002. I little knew at the time I was photographing boats simply waiting to be sold or scrapped.Lowestoft has an tiny inshore fleet,the trawler docks and basins have been turned into a centre for the wind turbine industry.The fishing trade left with barely a whimper. 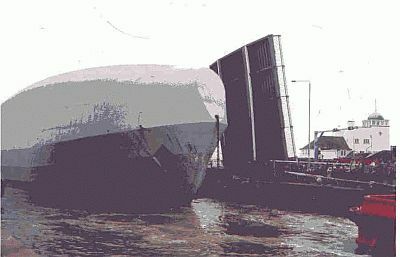 In April 2002 this odd vessel came into Lowestoft,apparently to be turned into a floating night club.Rumour has it that is an ex Russian spy ship converted from a trawler.Obviously with all that covered in deck it can't be used to catch fish anymore,Ted Heath achieved the same end result for the whole British trawler fleet with a piece of paper handing over historic fishing grounds to our EU masters and signing the death warrant of the British fishing industry. Early morning in Lowestofts trawler basin. 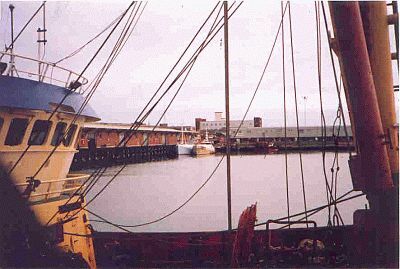 Colnes beam trawler St Anthony (now in Holland re-crewed, rebuilt,re painted and re named) and the tug ETA (long disposed of) in the calm waters of the Lowestofts trawler basin only yards from the harbour entrance and the North Sea.Behind the wheelhouse of the trawler the control room of Lowestoft's bascule bridge which gives boats access to the port of Lowestoft,Oulton Broad and the Norfolk Broads can be seen.This bridge is the subject of much controversy due to the traffic chaos it creates every time it's used.Its sole use now is to provide a backdrop for the MP to stand in front of as he prattles on aabout third crossings and investment in the area. The fish catches were landed on the quay where the two smaller fishing boats are moored,Lowestoft fish auctions were conducted in the buildings on the left.The beam trawler in the foreground having landed its catch of fish from the North Sea fishing grounds,was waiting to return to Colne shippings yard up river (now long gone), it's possibly now in Holland or more likely turned into razor blades.Most of the dock has now been taken over by the windmill industry. 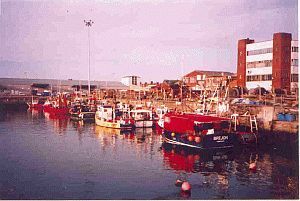 Pictured in 2003,then providing a safe mooring for the longshore fishing boats.Gill netters,longliners trawlers and more are sometimes seen here,although the numbers have declined.The grey building houses more of the Lowestoft fish merchants,the white structure in the centre is the Lowesoft Ice Companys ice making plant.This used to supply ice for the trawlers fish holds and to transport fish bought at the fish auctions. To the left was the East Coast oil wharf.There are under a dozen or so of these boats left in Lowestofts fishing fleet.Most of this dock is now a marina. A early spring morning in 2004 and fishing boats are getting ready for sea.Most of these boats fish by trailing a long line with baited hooks astern and are known as longliners.Often crewed with just a skipper and crewman or sailed single handed,these boats provided a precarious living for a dwindling number of fishermen,they.fish relatively close to the shore and are sometimes called longshore boats.Some charter boats offer sea angling trips from here,and Lowestoft's beaches are popular with beach anglers.. 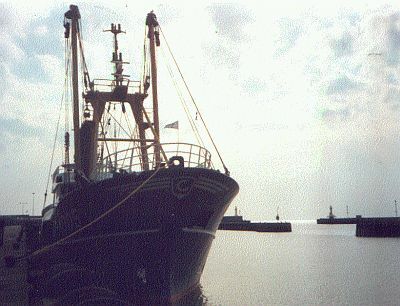 The entrance to the North Sea and its fishing grounds can be seen behind this beamer moored in the trawler basin.The two large uprights are the 'beams',earlier vessels launched and recovered their nets over the side,hence the nickname 'sidewinders'. The approaches to the port and the harbour itself are constantly dredged by the port operators Associated British Ports.There are no large fishing vessels seen here now apart from the so called 'flagships' which fly an English flag (actually they paint one on the funnel) and under ludicrous EU rules have to stay in an English port for eight hours every so often but contributing nothing whatsoever to the local economy as they do so.Well done Edward Heath. 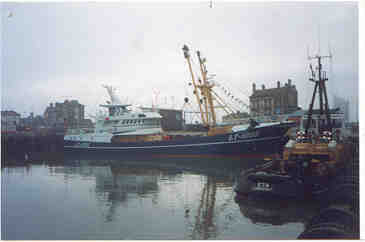 The St Georges, first large "beamer" in Lowestoft in the 1980's,operated by Colnes who at that time had a large profitable fleet.The firm had other interests centered around Lowestofts fishing industry,an oil wharf,ship repair yard,engineering workshops and a net making yard,these have now all gone. 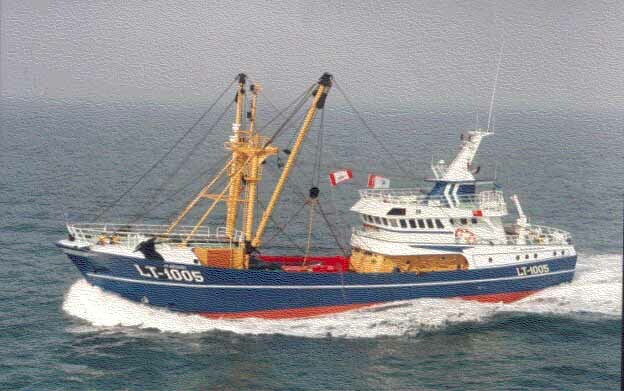 The St Anthony,built in Holland in 1998 was the largest boat fishing from Lowestoft harbour. Although similar in many respects to the St Georges the boat was larger and more powerful,and carried sophisticated electronic systems for fishing,fish finding and boat handling.The boat along with all the large trawlers from Lowestoft that weren't scrapped or broken up, is at present operating abroad,some apparently even went to Africa......time for a quick chorus of 'Rule Britannia'. More Boat Pictures A Lowestoft fairy story.